The Germinatrix » Blog Archive » Not NEARLY Enough Echeverias! Echeveria 'Arlie Wright' - one of the best of the best! If there is one plant that I DIE over that I don’t have enough of, it is Echeverias. I have a few, and I love them, but while I’ve gone crazy and grabbed every Aloe and Agave I can get my hands on, I haven’t been as aggressive in my pursuit of the ownership of echeverias. Why? They are such brilliant plants, and they do beautifully in my garden. Echeveria are native to the Americas, mostly to Mexico. 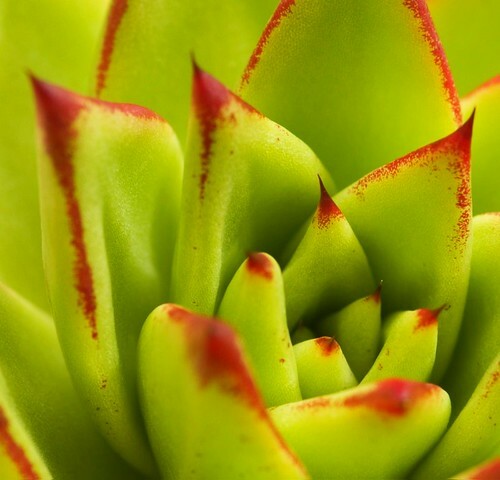 They are succulent, yes – but they like a little shade and water (not TOO much, especially in cooler climates) to look their best. They love sharp drainage. Does your garden fit the bill? Yes? Right on! Go to town and use these beauties as exquisite front -of – the – border detail plantings. Is your garden if a freeze zone, or in an area of the country where it rains and rains? Containers are the answer! But really – every garden should include some of these glorious specimens. 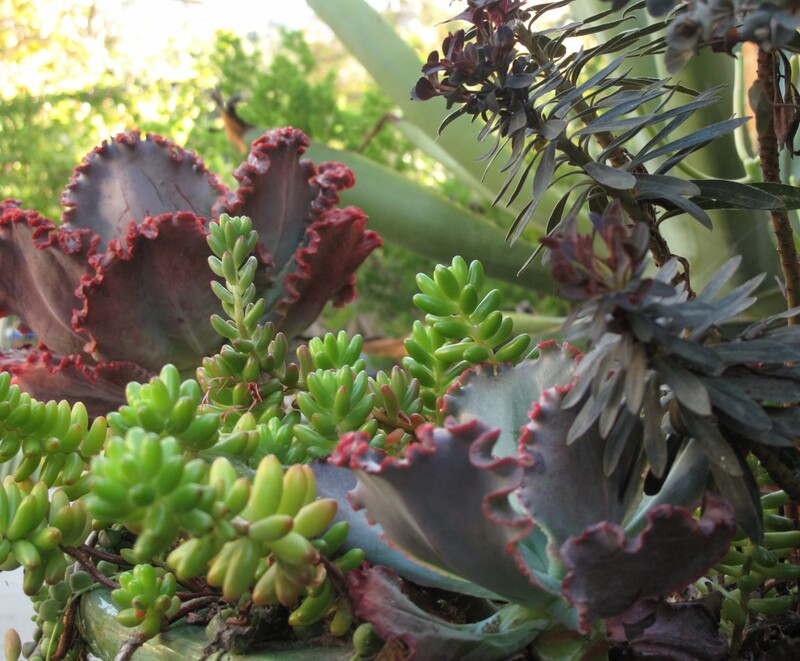 Echeverias can't help but be scene stealers in containers - they ooze charisma! As I was strolling around taking pictures, I was struck by the fact that I didn’t have MORE of them in my garden! I am missing some GREAT echeverias - Echeveria imbricata, Echeveria elegans, Echeveria agavoides ‘Lipstick‘ – well, I actually have a few ‘Lipstick’ but they aren’t looking too lipstick-y at the moment, so they aren’t being counted for the purpose of this post. These particular echeverias also form dense clumps in the front of a bed or border, making them heart-poundingly perfect choices to “seal the deal” – seeing these growing onto walkways, or cuddling up against rocks or slag glass just SENDS ME! talk about DETAIL - the edge of E. 'Mauna Loa' is a ruffle within a ruffle within a ruffle! 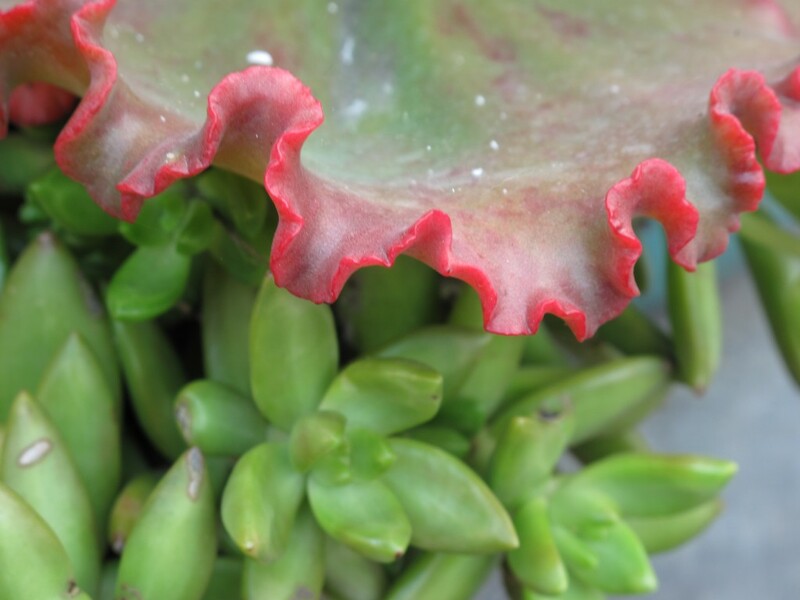 The last word in echeverias comes from my succulent guru, Debra Lee Baldwin, who prefers that people use echeverias in containers because they tend to get damaged in the ground. That has held true in my garden, but I have seen some beautiful clusters of rossette forming agaves performing beautifully in the ground; however, I admit that they DO tend to look fresher in containers. I say plant them everywhere – on the ground, in a pot, in a hanging sphere, in the nooks and crannies of a stone wall. Play with these beauties, and they will play back – they will show you their dramatic color extremes and they’ll delight you with their ease of culture. So what are you waiting for? Probably what I’m waiting for – my next paycheck. 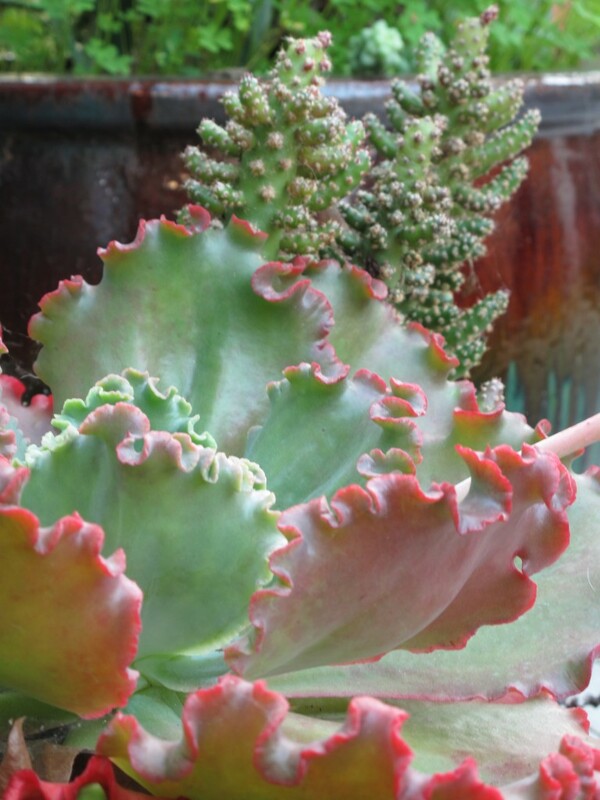 Then it will be an ECHEVERIA OVERLOAD – in the very BEST of ways! Echeverias are a weakness of mine, too! I especially love those big, ruffled varieties. Never saw an Echeveria I didn’t adore. They are plants that can be loved wholeheartedly–no drawbacks at all. ‘After Glow’ is my favorite–blue and pink and lavender, with orange flowers. They do well in the ground if you can give them some slope, either a berm you make, or if you live where it’s hilly. I used to think echeverias hated me until I realized that they couldn’t handle my full afternoon sun. I agree with hoover boo, I’ve never met one I didn’t love. My birthday is this Sunday, and if everyone I know were to give me an echeveria, I would be the happiest garden maniac in the WORLD! Sigh – alas, I know it is but a dream! Josh – J’adore the big crazy ruffled ones! especially when they have a strange ruffle in the middle of the leaf – WTF IS that? Whatever it is, I LOVE it! Darling Fern! 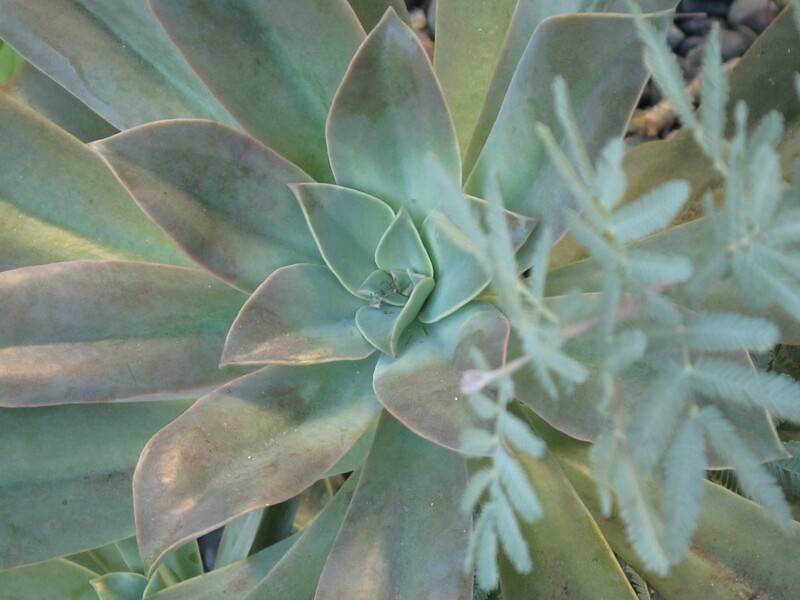 Yes, echeverias like a little shade in our harsh SoCal light – most of mine are planted in dappled conditions, or are tucked under other plants that can give them a little shelter from the harshest afternoon sun. I am with you and “Boo” – if it is an echeveria, GIVE IT TO ME!! !